I’m not really sure what to make of this. 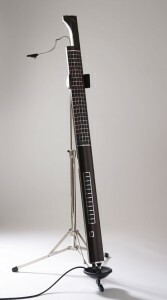 The Eigenharp Alpha. “A professional level instrument which allows the musician to play and improvise using a limitless range of sounds with virtuoso skill. The unique design of the keys makes this the most expressive electronic musical instrument ever made. The Alpha can play and record loops, change scale and key, transpose, alter tempo, program beats, create arrangements, switch and layer multiple sounds, all while the musician is performing live on stage. Available in a variety of finishes, it has 120 highly sensitive keys, 12 percussion keys, 2 strip controllers, a breath pipe and numerous pedal inputs. This gives almost endless possibilities for flexible keyboard layouts, fast instrument switching and expressive musical control. The comprehensive software system provides a wealth of musical performance features, including playback of its own native instruments, many common software plugins, soundfonts or midi instruments. If you go to their YouTube page, they have some sort of private demo. On the one hand, it looks kinda cool with the sliding and stuff. But why add a breath thing to it? Why not just make the touch surface sensitive to how you touch it? And do we really want lame-o drum and bass lines like that? Really? For 4K pounds ($7,000 US?) I’d expect something a little more cooler in the sounds department. It seems like this is a swiss-army knife of musical instruments. I mean, in the private demo, they had someone play GUITAR with them. Seriously? You mean this thing can’t do strumming like a guitar? Why not? Interesting idea, but doomed to failure. They also have plans for a smaller version. Create Digital Music has a link here and here for more information.